"I'm just astounded," said Cortez, Ingram Professor of Cancer Research and professor of Biochemistry. 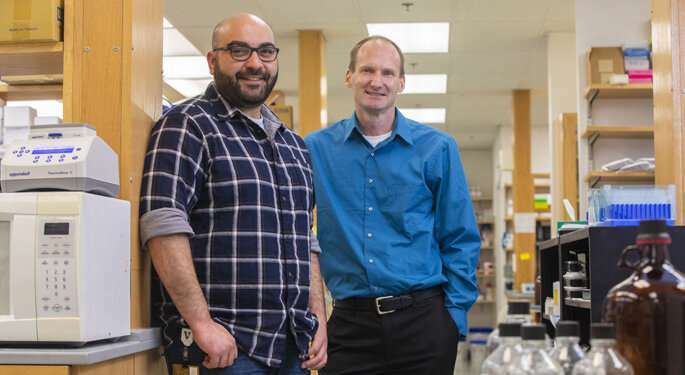 The investigators, led by postdoctoral fellow Kareem Mohni, Ph.D., have discovered a new DNA repair mechanism. "DNA repair is a very mature field. The Nobel Prize was given a few years ago to three scientists who studied DNA repair in the 1970s and 80s," Cortez said. "People are still very interested in DNA repair, and there are important questions that we're asking, but the idea of finding a whole new repair mechanism … nobody would have thought this is possible." The new mechanism, which is initiated by a protein called HMCES, was reported in the journal Cell. HMCES was one of more than 200 proteins that Cortez and his colleagues previously identified as belonging to the molecular machinery that duplicates DNA each time a cell divides—the DNA "copy machine." Some of the proteins on the list had known functions related to DNA replication, and others, including HMCES, did not. Cortez and Mohni were curious about HMCES because of its high conservation among species. "There is a HMCES-like protein in every organism on the planet—in humans, flies, frogs, bacteria, the things that live in the thermal vents in the ocean … it's there," Cortez said. "That said to us that it's got to be doing something really important because it's been around for billions of years of evolution, but no one had ever studied it in the context of DNA replication." The researchers deleted the HMCES gene in cells to look for problems with replication, but they didn't find any—cells missing HMCES were able to duplicate DNA and divide. When the researchers challenged these cells with agents that damage DNA, however, they discovered that HMCES was required to keep the cells healthy. But they were stumped by the findings. The DNA-damaging agents they used are known to cause specific types of damage that are repaired through various unrelated DNA repair pathways, Cortez said. Cortez credits Carmelo Rizzo, Ph.D., professor of Chemistry at Vanderbilt, with moving the research forward. "Carmelo said, 'The one kind of lesion that's common among those types of DNA-damaging agents are abasic sites,'" Cortez said. "That insight was key." Abasic sites result when the base—the A, T, G, or C—is lost without causing a break in the DNA. They are the most common type of DNA damage and happen as many as 20,000 times per day in human cells, Cortez said. When abasic sites occur in double-stranded DNA, they are rapidly repaired by a pathway called base excision repair. But there was no known mechanism to repair abasic sites that occur in single-stranded DNA. The new findings demonstrate that HMCES fills this role. The team showed that HMCES binds to the abasic site and forms a DNA-protein crosslink. This protects the abasic site from being incorrectly repaired by a "bypass" polymerase that puts in a random base to keep replication going, with the potential of causing mutations. Cells missing the HMCES protein accumulate DNA damage, are hypersensitive to DNA-damaging agents that cause abasic sites and have increased genetic instability. It's unclear how DNA-protein crosslinks, which are bad for cells, launch a DNA repair mechanism. "It's almost like this protein takes a bad situation and makes it worse. But somehow it gets resolved because we find that it's preventing mutations," Cortez said. He and his colleagues are studying what happens next to resolve the DNA-protein crosslink and repair the abasic site. The ability of HMCES to form DNA-protein crosslinks might also make it an attractive drug target, similar to the topoisomerase enzymes that form such crosslinks and are targets for chemotherapy agents and antibiotics, he said. "If a drug only reacted with a bacterial HMCES protein, for example, it could stabilize the DNA-protein crosslinks and be a lethal antibiotic," Cortez said. "We need to figure out the next steps in the repair mechanism so that we can think about how to target it."